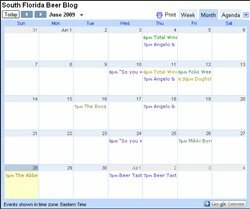 Friday, May 7th, South Florida Beer Blog will be celebrating its One Year Anniversary at Abraxas in South Beach. It will be a special celebration full of surprises, giveaways, and rare treats. The night will also kick-off the Cigar City Brewery weekend at Abraxas. There will be taps of Jai Alia IPA, Patio Tools Dry Irish Stout, and possibly a surprise third. We'll also have bottles of Big Sound Scotch Ale and....wait for it....HUNAHPU Imperial Stout – rated #8 BEER IN THE WORLD!!!!! How's that for a rare treat? With your first purchase of Hanahpu you will get the Cigar City snifter glass it is served in for FREE, just make sure you tell them you're there to celebrate with South Florida Beer Blog. More info coming up so keep your eyes peeled. I hope to celebrate this momentous occasion with all of you so make sure to mark your calendar. Friday, May 7th @ 8:00pm-?